There are so many tools out there that can assist you as an agent. Making sure you are digitally using tools for leads it essential. Today we have put together three different approaches you can use in order to generate leads from consumers who may not have engaged an agent. 1. Twitter: Twitter can be a great tool for lead generation. Whilst the search function does need some improving, if you undertake searches about the local area you are representing and search for key criteria you can help with you can generate leads. As you can see, it would be great for this person to get a follow up from an agent about what they are looking for. Going to this level will really set you apart. 2. Homely Notifications: By signing up to Homely you can sign up to local areas to hear news and local discussions. 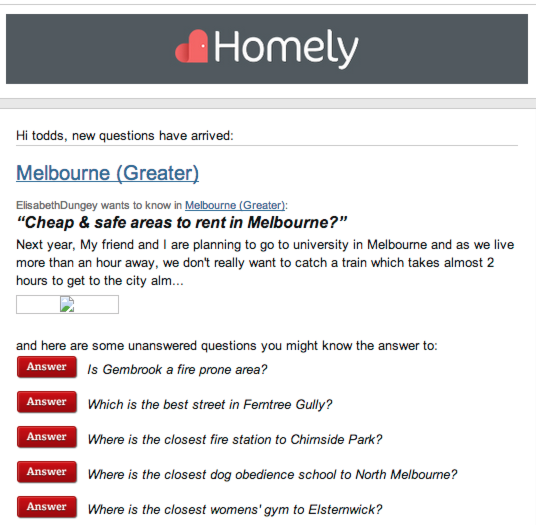 When you have done this you will receive email updates about locals posting questions who are looking for answers. Some of these questions may be based upon needing an agent to assist them in their search for a home. 3. Attend local auctions: One of the greatest ways to network is to be amongst the people who need your services. It amazes me how few people attend auctions by other agents, due to the fact of the amount of people there who are looking for property. At every auction there can only be one buyer, but a plethora of people who are looking who will be wanting the experience of a local agent. Going there and demonstrating your local knowledge is great. It is important you approach this as a very relaxed agent and not one trying to get leads. Building conversation and trust is essential to long term relationships.